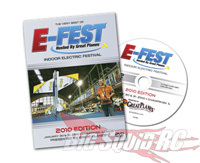 E-Fest 2010 DVD « Big Squid RC – RC Car and Truck News, Reviews, Videos, and More! For all those that missed E-Fest 2010, Great Planes has a DVD featuring all the highlights! Pylon Racing, Freestyle, Combat, and more! If you are into the RC Flying scene, and weren’t there, you should add this DVD to your shopping list! Check out the Great Planes website for more info.